This class is geared towards expecting mothers in all trimesters of pregnancy. 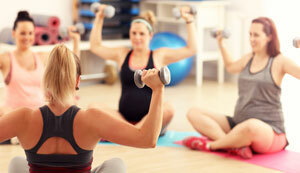 The goal of this class is to increase overall stability, strength, and endurance for your upcoming labor and delivery. Participants will be coached in small groups ensuring one on one attention as well as group training. Please note that this is not a traditional fitness class, nor is it a Bootcamp class. The goal of this class is to increase overall stability, strength, and endurance for your upcoming labor and delivery. Although taught in a group setting, the effort will be made to give specific attention to each individual’s unique stage in their postpartum journey. Participants will be encouraged to meet and accept their body wherever it’s at after the transformative processes of pregnancy and birth, and from there, will be challenged to progressively, responsibly build a foundation of fitness and strength. For more information contact RoslynZ@TheJKC.org or 913.327.8155.